The ToughBuilt Universal Gravity Miter Saw Stand transforms how you work with your miter saw. It instantly folds with the saw locked in place to be rolled away and stored. It transforms how professionals use their saw. This stand features heavy duty boxed tube frame for the best strength and stability. 2 work supports and work stops extend out to a class leading 10ft to support longer materials. Rugged solid rubber tires with steel hubs won't deflate or wobble during cutting, and glide over the roughest terrain. Additional features such as a spare parts tray, one-handed use cam locks and rugged feet make cutting jobs effortless in the most rigorous working conditions. Universally compatible with most brands of miter saws. Folds Effortlessly with or without saw attached for easy transport. 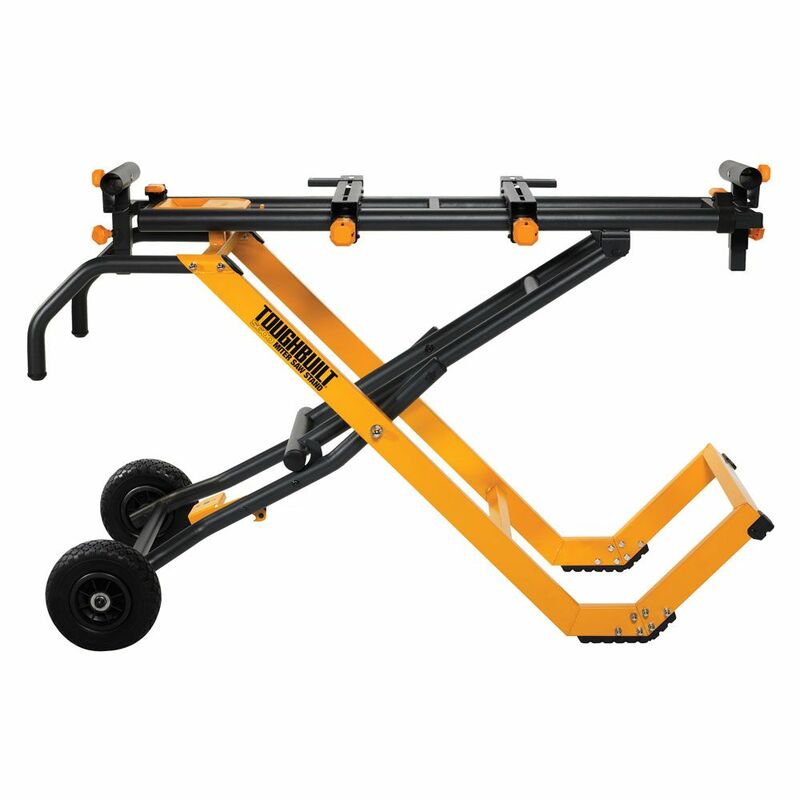 The portable, lightweight model MS3102 miter saw stand features a tubular steel frame with large 1.5 inch diameter legs and dual crossbars. The universal mounting adapters are designed to fit most saws. The height adjustable support extensions are equipped with handy material cutting stops and rollers. Designed to roll out, set up in seconds, and transform any garage or driveway into a practical workshop, the rugged, lightweight contractor grade MS3102 miter saw stand is loaded with features. Ergonomically designed, the General miter saw stand has a 35-inch work height to reduce back strain. Universal QuickSet Miter Saw Stand The ToughBuilt Universal Gravity Miter Saw Stand transforms how you work with your miter saw. It instantly folds with the saw locked in place to be rolled away and stored. It transforms how professionals use their saw. This stand features heavy duty boxed tube frame for the best strength and stability. 2 work supports and work stops extend out to a class leading 10ft to support longer materials. Rugged solid rubber tires with steel hubs won't deflate or wobble during cutting, and glide over the roughest terrain. Additional features such as a spare parts tray, one-handed use cam locks and rugged feet make cutting jobs effortless in the most rigorous working conditions. Universal QuickSet Miter Saw Stand is rated 4.2 out of 5 by 26. Rated 5 out of 5 by tukn20z from tough built I've looked around and reviewed the other miter saw stands and this fit my needs and is well built, great features and simple to use !! Rated 4 out of 5 by Jeff from Instructions left a bit to be desired, just pictures, but... Instructions left a bit to be desired, just pictures, but seems well built for all of that. Once set up with the saw it is easy to to fold and move.. Rated 5 out of 5 by RFB from The unit arrived promptly; intact, undamaged and complete with all... The unit arrived promptly; intact, undamaged and complete with all the pieces. Assembly was straightforward. It is sturdy, mobile and easy to collapse/set up. Since I don’t always “fold it up” to store it, a pair of handles on the end OPPOSITE the wheels would be great for moving it around. Rated 4 out of 5 by David from Product was great except one of the extendable arms adjustable screw holes was bored out so I wil... Product was great except one of the extendable arms adjustable screw holes was bored out so I will have to grind the old one off and weld a new nut on it. Package was not taped well at all. And one of the bolt packages had split open. Only one screw gone. That was my biggest complaint. Rated 5 out of 5 by Jake from Great stand had the rigid for years this is the... Great stand had the rigid for years this is the same exact stand but I like it matches my 12” dewalt saw and looks better in my opinion. I like the tires on this one much better also. Rated 5 out of 5 by Gps2 from Great Tool A great addition to my shop. Folds easily and works as advertised!